Writing is a lifestyle. It’s a lonely journey that requires an enormous amount of courage to sail through. People only hear about the success of successful writers. What they don’t see is the untold story of struggles and challenges a writer had to endure before getting to the level of achievement proclaimed about them in the media. One of the helpful tools most writers use to nudge themselves to work harder, and increase productivity is reading success stories of fellow writers, including quotes about writing. As a blogger and freelance writer, reading through quotations about writing has always been a great source of inspiration to me. Each time I feel like giving up on a writing project, I turn to writing quotes for motivation. 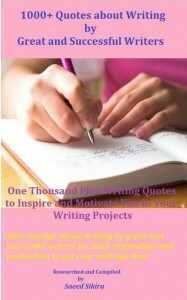 1000+ Quotes About Writing by Great and Successful Writers is available as a free download from Amazon’s website from February 12, 2014 through February 16, 2014. For more free eBooks, check out our 10 Websites to Download Free eBooks list, as well as our Free eBook of the Day archive.